Jose Gonzalez is touring the US with Zero 7 and they are hitting Seattle as part of the Bumbershoot lineup in September. I saw them play in Brighton (UK) shortly after The Garden released - brilliant, I want more. If you've not heard of Jose Gonzalez, you might recognize his Heartbeats track from the 'Veneer' album. It was used in the Sony Bravia ad (short version here 3.5m views! 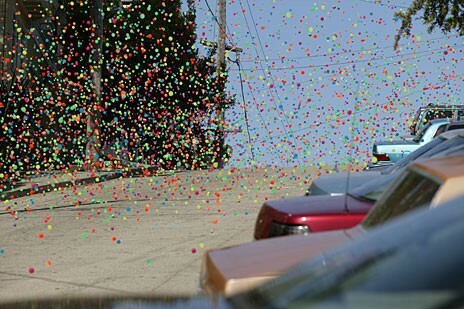 - 250,000 multi-colored 'superballs' bouncing down the streets of San Francisco, no CGI used -see this). One of those 'oh yeah, I know it' tunes. Gonzalez is excellent solo is opening (I think) for Zero 7 at Bumbershoot. Playing together and live, 'Crossroads' track and 'Today' are really special. Currently, my favorite track from the Garden album is 'Seeing Things'. Can't wait to see them again.